This year marks the 150th anniversary of the publication of the first edition of Te Paipera Tapu ‒ The Holy Bible in Māori. Te Paipera Tapu, first published in 1868, has just been digitised. This digitised version will be one of the many tools used to help produce a brand-new translation, in more contemporary language for today’s Te Reo Māori speakers. A new mobile Paipera Tapu app is also in development and will feature the Paipera Tapu text (2012) as well as English Bible translations. The new app will be launched in early 2019. 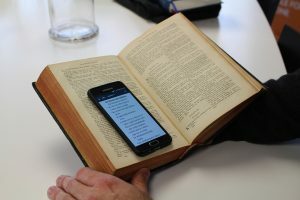 While the first Scriptures in Te Reo Māori were published in Sydney in 1827 by the New South Wales Bible Society, Te Paipera Tapu was the first ever full Māori Bible. This edition was followed by three further versions in 1889, 1925 and 1952, as well as a reformatted edition of the 1952 text, which was published in 2012. Then there was Tāku Paipera, the only Māori Children’s Bible storybook available, launched in 2016. Today Bible Society New Zealand has a number of Te Reo Māori resources available.